Balluff Inc., Florence, KY, has expanded its SmartLight line of LED tower lights, fully programmable multi-purpose lights that indicate the status of virtually any plant operation. The lights assist plant operators in keeping machines and processes operational on a daily basis. Employees from the top to the shop benefit by clearly and visually understanding the status of their workstation or their next load, and gain insight into where bottlenecks occur. Typically, stack lights or human-machine interfaces (HMIs) are integrated to communicate process status. By using a software-configurable smart light to indicate machine status, according to Balluff officials, users can simplify visual indication with a single part number that costs less than most HMIs. The SmartLight's modes of operations can be switched on-demand, based on programmed conditions, to provide process feedback such as cell operation status, tank fill levels or operator progress along an assembly line, or even to warn of unsafe conditions. To enhance functionality, SmartLights can be fitted with a 95-dB buzzer. "We are seeing tremendous demand for SmartLights and impressive creative uses of it in areas from process feedback to error-proofing to efficiency improvements,” says Tom Rosenberg, director of marketing at Balluff. The SmartLight is available in three models: one-, three- and five-segment units with a buzzer option for each model. Each segment of a SmartLight consists of multiple LEDs and can be programmed for user-selectable colors and brightness levels to ensure desired attention in the plant. "SmartLights are designed to reduce complexity and enhance ease of use on the plant floor," says Shishir Rege, Balluff marketing manager. "As each segment of the SmartLight is programmable, a one-segment SmartLight can be used instead of a three- or five-color generic stack light and users don’t have to worry about spares for individual color lights to power up the stack light." SmartLights offer as many as three modes of operations: stack light, level indicator and run light. 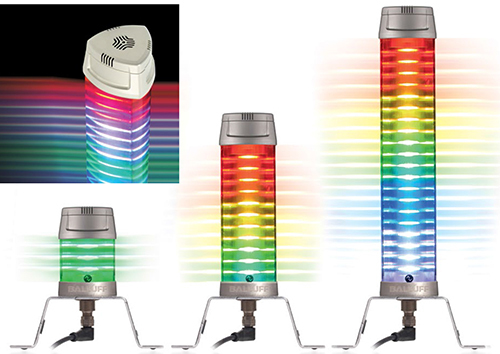 Stack-light mode includes programming of one to five positions of 20 rows of 360-deg.-visible LEDs, with user-selectable colors and the ability to switch between solid, flashing and blinking display. Level mode uses individual LEDs to display level, and offers the ability to configure colors, measurement zones and levels. In run mode, running status is indicated with a simple scrolling light that can signal a problem or required action. SmartLight utilizes IO-Link technology, making it adaptable to any major network or fieldbus. All configuration and programming for the SmartLight is performed in the controller or the PLC. Add-on instructions or function blocks ease programming, and standard M12 sensor cables ease installation.